Gott Heart Art: What's The Latest Dirt? A Great Good Morning to all. Hope you are all up for a great challenge this week. 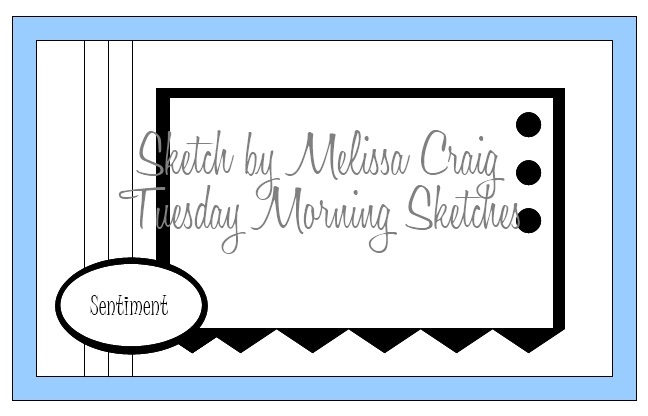 Melissa at Tuesday Morning Sketches has created a wonderful sketch for us to sink our teeth into and Deedee's Digis has provided the team with some neat digis to play with. Don't hesitate to hop over to Deedee's place and browse around after you take a look at the great cards the team has created for your inspiration. 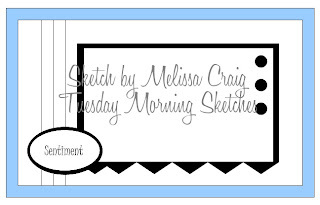 The only tweaking I did to the sketch this time was instead of an oval for the sentiment I used a set of stamps that coordinate with Stampin Up's Curly Label punch and made the sentiment fit into the small oval punch, which allowed me to pop it up just a little for some added punch. That's the neat thing I'm learning about digi stamps, you can resize them, flip them, do all kinds of things with them as you get used playing around in whatever program you open them in. I used some pretty designer paper and yes, there's Martha's zigzag border punch again. I think the dirt turned out kind of neat, I used Copic markers for all the coloring and then I took some chalk and dabbed and rubbed to give the dirt a softer look. I couldn't resist paper piecing the gloves, it really makes them look like they are laying on top of the ground, I really liked that added dimension. Finished it off with the 3 cute little flower brads and Wah Lah! a wonderful card to send off to a friend you haven't chatted with for awhile. Thanks for stopping by, look forward to your comments(you know what a comment hog I am) and don't forget to stop by our talented team members blogs and leave them some love also. Supplies: White Card Blank 5" X 6 1/2" Halcraft, Papers: Stampin Up-Pear Pizzazz, Whisper White, DCWV Whimsy Stack, Dear Lizzy & Am. 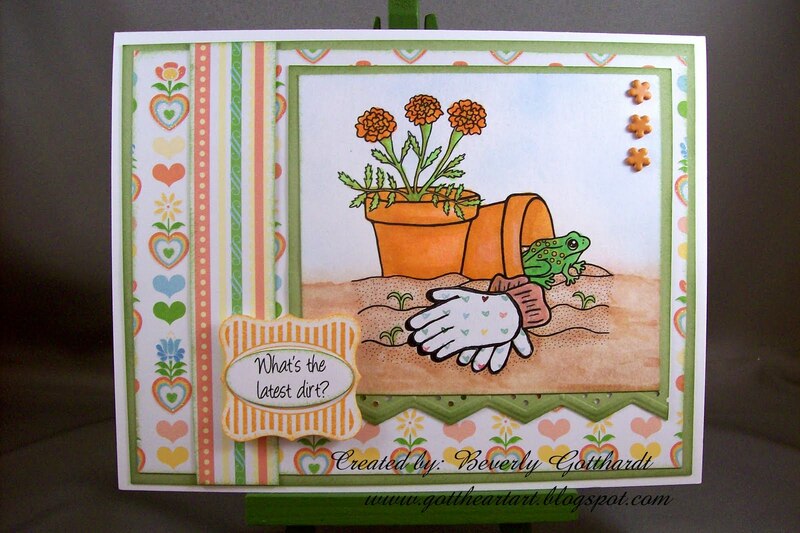 Crafts-Spring Picking Pansies, Stamps: Deedee's Digis-Bloom Wher You're Planted, Stampin Up-Cute & Curly, Ink: Stampin Up-Pear Pizzazz, Peach Parfait, Stampin Up marker-Blushing Bride, Copic markers-YR07, YR04, YR02, Y17, YG95, YG07, YG05, R02, E13, YR14, Stampin Up-Curly Label punch, Martha Stewart-zigzag border punch, Inkadinkado Blending Chalks, small flower brads unknown, pop dots. Fabulous card Beverly! I love this image from Deedee and frankly I am intimidated by it. I'm not sure I could give it the justice it deserves. But you so rocked it!! Absolutely gorgeous. I love how you tweaked the sentiment. This is such a fun image, Beverly; I almost picked this one, too! Perfect touch with the paper-piecing on the the gloves and I really like how you matted your sentiment!! If only gardening and playing in dirt were this beautiful - I'd gladly partake!